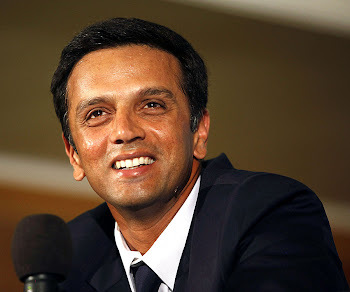 At the time, all Rahul Dravid dreamt of was to play for India and he admitted that by joining the elite club he had, in some way, exceeded his own expectations. "I can see that picture in my mind, watching it on television - Gavaskar late-cutting in Ahmedabad and raising his bat for his 10,000. I never had an ambition to do it, because I never believed. "As a young kid, to be honest, I didn't have the self-belief I could do it. When I look back, I probably I exceeded my expectations with what I have done over the last 10-12 years. I can look back and reflect that I maximized my potential over these years." "I pretty much coasted for the last five-six years through my career," he said. "I had to work pretty hard from 9000 to 10,000. In some ways, it was a sign for me to learn to enjoy these things, learn to reflect on these moments. The last 1000 has been a learning curve for me. "It has been a tough year in some ways. I have been playing well in patches. I have been fighting through it. I felt at phases it was coming back and probably just breaking my finger in the last game in Adelaide [gave me a break]. I was completely off for six weeks. I picked up the bat two or three days before the Deodhar Trophy game. I got a couple of good scores - a hundred and a fifty. I came into this Test feeling really good." This hundred won't be remembered for its fluency, neither was it made in demanding conditions. In fact he took just six balls less to reach his hundred than Virender Sehwag had done to get three times as much. He wasn't in too much trouble but he did get into phases where he was bogged down. Where would he place this innings among the 25 he's made? "I place the ones higher when I end up winning those games. Even the 90 at Perth is a lot more significant for me than some hundreds I have got. The South Africans bowled well today - tighter lines and they also got the ball to reverse-swing. I think I just felt happy I was solid and in control right through the innings." He maintained the one-day milestone was special but was clear about valuing his Test runs more. "Test cricket is much tougher in the end. You look back on that and you recognize they are the toughest ones to get. You will always cherish you Test performances a bit more than the one-day ones. You know the 10,000 you got in Test cricket has probably been a bit tougher." That's an unbelievably humble comment from a legend. Classic Dravid. Good blog you've got there. Nice to see another Dravid fan. Cheers!